Combine the peanuts and sugar in a bowl and mix well until the sugar is evenly distributed. Brush the base of a 20–25cm square cake tin generously with melted butter. Line the tin with 4 sheets of filo pastry – 2 horizontally and 2 vertically. Don’t worry about overhanging pastry – it will be folded over the nut filling. Spread the sugared peanuts evenly in the tin and gently flatten to create an even surface without pressing them into the pastry too forcefully. Fold any overhanging pastry over the filling and brush with melted butter. Fold each of the remaining sheets of filo pastry in half to create squares and lay these over the peanut filling to cover it. Brush the top generously with melted butter, ensuring enough butter runs down the insides of the tin so that the entire baklava has enough butter for cooking. Using a very sharp knife, cut diagonal lines across the top pastry layers as neatly as possible. Bake for 25–30 minutes, until deep golden brown all over. Meanwhile, make the orange syrup. Put all the ingredients into a small saucepan set over a medium-high heat and dissolve the sugar in the water. Stir well and leave the liquid to reduce for about 15 minutes, until it has a syrupy consistency. When the baklava is cooked, immediately pour over the orange syrup. Leave to cool completely. To make the sauce, put all the ingredients into a small saucepan set over a low heat and melt the chocolate into the cream. As soon as the mixture is smooth and evenly combined, remove the pan from the heat. 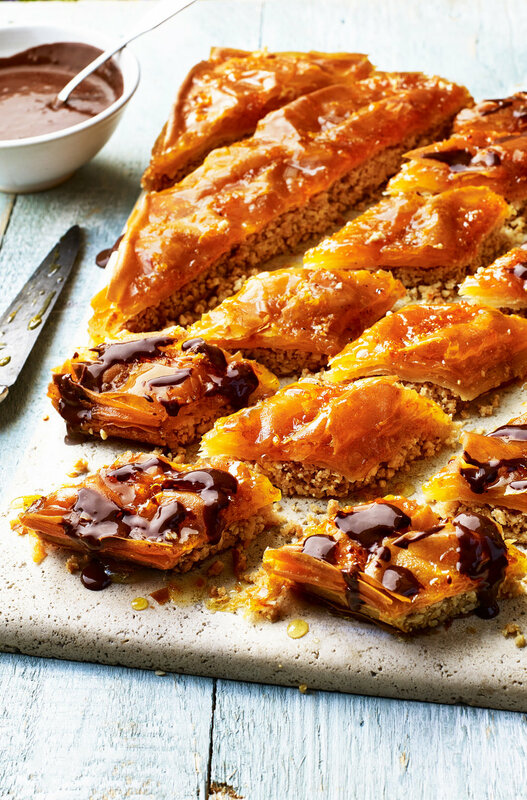 To serve the baklava, either remove the entire thing from the tin using a fish slice and set it on a serving dish, or cut out little pieces to plate up. Drizzle over the chocolate sauce as desired and serve.